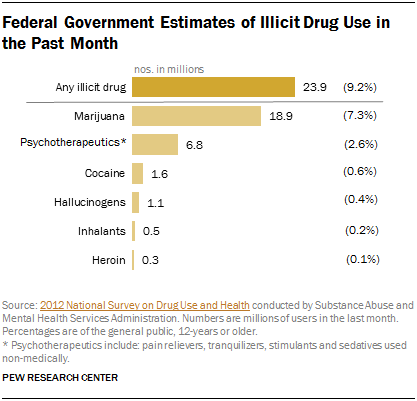 The federal government’s annual survey on drug use in the United States finds that the use of illicit drugs has increased over the past decade, in part because of a rise in marijuana use. The government treats marijuana as an illicit drug; marijuana is now legal for medicinal use in 18 states and for recreational use in two others (Colorado and Washington). According to the 2012 drug use survey by the Substance Abuse and Mental Health Services Administration, approximately 24 million Americans (9.2% of the general public aged 12 or older) reported using an illicit drug in the past month. This is up from 8.3% 10 years earlier. The number of Americans who had used marijuana in the last month increased from 14.5 million in 2007 (5.8%) to 18.9 million in 2012 (7.3%). Among the so-called “hard drugs,” heroin use more than doubled from 166,000 to 335,000 individuals per month between 2002 and 2012. Cocaine use declined slightly over this same period. In 2012, 6.8 million Americans used prescription-type medications that have legitimate medical uses, such as pain relievers including Oxycontin and Vicodin, but for non-medical purposes (referred to as psychotherapeutic drugs). These figures are statistically equivalent to usage levels going back to 2002 (2.7%). About a third of all Americans (32%) say that the problem of drug abuse is a crisis across the country and another 55% see it as a serious problem. When asked to think about their own neighborhoods, including the local schools, about one-in-ten (12%) see drug abuse as a crisis in their community and another 38% call it a serious problem. Opinions about the problem of drug abuse differ little across most demographic and political groups. But young people are less likely than older Americans to say that drug abuse is a crisis nationally. Just 20% of those under 30 think drug abuse is a crisis compared with at least a third in older age groups. And 60% of young people say the problem of drug abuse in their neighborhoods is either a minor problem or not a problem, the lowest percentage of any age group. Hispanics and those without college experience are more likely to view drug abuse as a serious problem in their neighborhood. 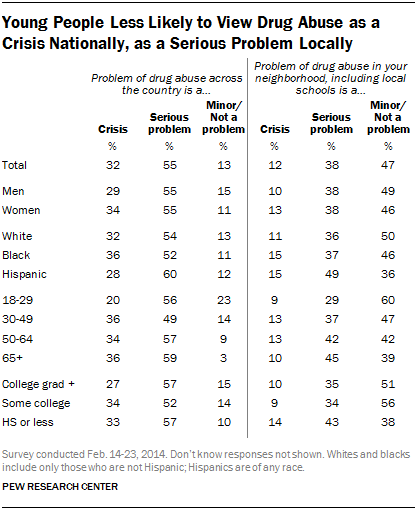 A majority of Hispanics (63%) say that drug abuse is either a crisis or serious problem in their neighborhood, compared with about half of both non-Hispanic blacks (51%) and non-Hispanic whites (47%). Among those with a high school degree or less education, 58% say drug abuse is a neighborhood crisis (14%) or serious problem (43%). College graduates see drug abuse as less of a problem in the neighborhoods where they live: 10% see a crisis, 35% a serious problem. Two decades ago, blacks were far more likely than whites to say that the problem of drug abuse was a crisis in their neighborhoods and schools; in 1995, 28% of blacks and just 9% of whites saw drug abuse as a crisis locally. 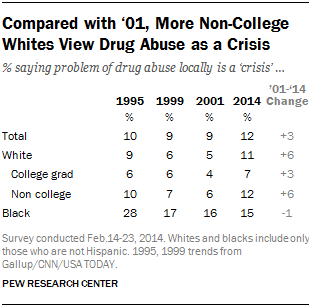 The share of blacks saying drug abuse in their communities is a crisis declined later in the 1990s. By 2001, 16% of blacks regarded the problem of local drug abuse as a crisis; that is little different from the current measure (15%). Compared with 2001, a greater share of whites – particularly less educated whites – say the problem of drug abuse in their communities is a crisis. Currently, 12% of non-college whites say drug abuse is a crisis in their neighborhood, double the percentage that said this 13 years ago. More than six-in-ten (63%) say that state governments moving away from mandatory prison terms for non-violent drug crimes is a good thing, while just 32% say these policy changes are a bad thing. This is a substantial shift from 2001 when the public was evenly divided (47% good thing vs. 45% bad thing). Across nearly all demographic groups majorities say that the move away from mandatory prison terms is a good thing, and in most cases these percentages have increased by double digits since 2001. Majorities of both men (64%) and women (62%) view these policy changes as a good thing – up 13 points among men and 20 points among women. In 2001, women were less supportive than men of sentencing revisions. Half of women said it was a bad thing compared with 40% of men. As is the case with opinions on other issues related to illegal drug use, older Americans and Republicans are most likely to have reservations about state governments moving away from mandatory drug sentences. About half of those 65 and older (49%) say that the move away from mandatory drug sentences is a good thing, up only modestly from 2001 (43%). By contrast, majorities among younger age groups have a positive view of the elimination of mandatory drug sentences, and this view has increased by double digits among those under 65 since 2001. About half of Republicans (49%) have a positive view of the move away from mandatory drug sentences; in 2001, 41% viewed this change positively. Nearly seven-in-ten independents (69%) and 66% of Democrats say this is a good thing, up from 48% each in 2001. The pattern is similar in opinions about how the government should deal with people who use illegal drugs such as heroin and cocaine. Two-thirds (67%) say the government should focus more on providing treatment for people who use these type of drugs. Just 26% think the focus should be more on prosecuting illegal drug users. Half or more in virtually every demographic and partisan group says the priority should be treatment, not prosecution. But there are differences across racial and ethnic lines: 81% of blacks say the government should focus more on treatment for drug users, compared with 66% of whites and 61% of Hispanics. In addition, while large majorities of Democrats (77%) and independents (69%) want the government’s focus more on treatment, a smaller share of Republicans (51%) favor this approach. Those 65 and older are less likely than those in younger age groups to say that the government should focus on providing treatment for drug users rather than prosecuting them. Those who view drug abuse across the country as a crisis are about as likely as those who do not to favor treatment rather than prosecution for those using illegal drugs like heroin and cocaine. Among those who say drug abuse is a crisis in their neighborhood, 64% favor the treatment option, about the same percentage as those who view the problem less seriously (68%).